Source: Occupational Safety and Health Administration. Alkylation (al-kuh-ley-shun) is a secondary refinery unit operation that many refineries in the United States have because it adds high octane hydrocarbons to motor and aviation gasoline. High octane hydrocarbons are needed to help prevent autoignition of gasoline (knocking) in an engine and to meet recommended engine octane ratings. The process combines an unsaturated light hydrocarbon (propylene, also known as propene, or butylenes, also known as butene) with isobutane to produce alkylate (al-kuh-leyt). Either sulfuric or hydrofluoric acid is used as the catalyst for the alkylation reaction. Alkylate is high in octane but has low volatility and can be added to motor gasoline and aviation gasoline to increase octane while meeting stringent volatility specifications. Regardless of the acid-catalyst used, the alkylation process reacts with a hydrocarbon that has double bonds, such as propylene or butylene, with isobutane. The resulting product is usually a seven- or eight-branched carbon molecule. Unlike cracking, which increases total volume of products versus the feedstock by reducing density, alkylation takes two low-density feedstocks and produces a higher density product. The feed volume is reduced by about 30% while maintaining the same weight. Each catalyst also has different operating conditions (like temperature and pressure) along with different safety considerations. 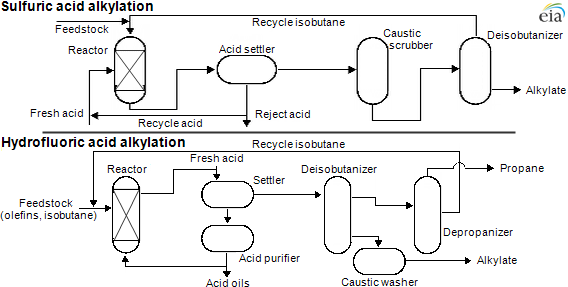 Sulfuric acid is a liquid at unit operation conditions, while hydrofluoric acid is a gas at unit operating conditions.